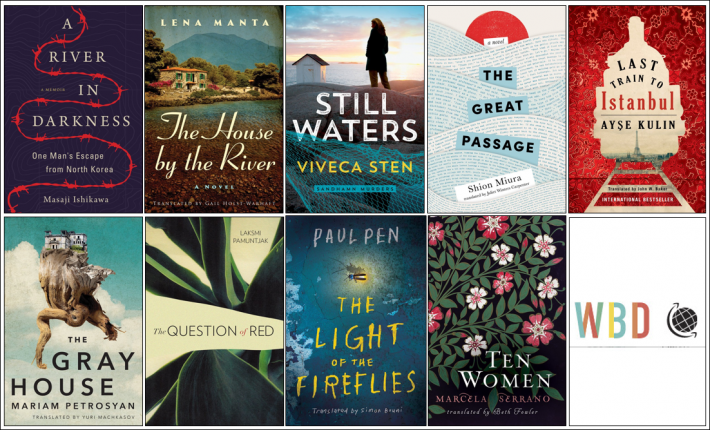 In support of translated fiction, AmazonCrossing—the translation imprint of Amazon Publishing—is giving readers a chance to read nine of its most prominent and successful translated titles free of charge for a limited time. On the imprint’s World Book Day “Read the World” page, you’ll see just how eager an uptake the offer is getting. The Amazon Charts system, updating every few seconds, is displaying how many pages of these nine books have been read in their Kindle editions during the period of the free downloads. At this writing early in the offer, readers had already logged a staggering 1,011,825 pages. By the time you hit the page, the number will have jumped substantially. The occasion is the approach of World Book Day on Monday (April 23), when UNESCO will also name Athens the World Book Capital for the year in a handoff from Conakry, Guinea, and with the royal family of the United Arab Emirates’ Sharjah present to represent the emirate’s preparations to accept the designation in 2019. As regular readers of Publishing Perspectives know, AmazonCrossing has become a leader in translation output under the guidance of its editorial director, Gabriella Page-Fort. While Amazon Publishing and its translation imprint are trade publishing operations—and not part of the self-publishing platform—the rapid, expansive success of the translation effort, in particular, is in no small part boosted by Amazon’s sales power. In a prepared statement about the limited-time introduction of these books to readers,Amazon Publishing chief Mikyla Bruder is quoted, saying, “We believe books have the power to connect us across language, country, and culture. The list of nine key titles you can obtain now through April 24 in their digital editions demonstrate the bracing sweep of what Crossing’s effort is revealing: when top-quality translation is applied to books beyond literary fiction, many of the world’s most avid book consumers are ready to read. Many of Crossing’s titles are literary. But you’ll find, even in this nine-book collection, that there’s also family saga, memoir, murder mystery, heroic romance, inspirational fiction, and politically powered drama. Here are the nine books you now can download from AmazonCrossing without charge until 11:59 p.m. Pacific Time on Tuesday (April 24), or 6:59 a.m. GMT (April 25). The descriptive information is from Amazon Publishing. A River in Darkness: One Man’s Escape from North Korea by Masaji Ishikawa, translated from Japanese by Risa Kobayashi and Martin Brown: An Amazon Charts best-selling memoir about one man’s harrowing escape from the oppression of North Korea. Those familiar with Crossing’s work will recognize not only key authors here but also some of the most gifted translators working with the house. Simon Bruni, for example, based in the UK, is a prolific translator, a three-time John Dryden award winner, and a key member of the British translation community. His other titles include Desert Flowers by Paul Pen (2017 AmazonCrossing) and The Color of Evil by Armando Rodera (2014, Thomas & Mercer). So colloquial and comfortable is Gail Holst-Warhaft’s translation of Lena Manta’s The House by the River that many are hoping she’s tapped to translate Manta’s new The Golden Letter, which Metamorfossi’s Psichogios Publications recently has sold to Crossing (a deal we expect to list in our upcoming Rights Roundup on Tuesday). John W. Baker’s translation of Ayşe Kulin Last Train to Istanbul has been a standout seller both in the States and in the UK. And Beth Fowler works in Glasgow and is an Inverness native, whose specialization in Spanish won her the (Penguin Random House) Harvill Secker Young Translators’ Prize in 2010. She’s also the translator of Argentinian writer Iosi Havillo’s 2011 Open Door. Publishing Perspectives will have more on translation next week from the Abu Dhabi International Book Fair—which is presenting 25 new translations from English, French, and German in the Kalima Translation Project—and from Berlin’s Publishers’ Forum as well as Athens’ World Book Capital events. And with offices in Seattle, New York, Grand Haven, Luxembourg, London, Munich, Milan, Madrid, and Paris, Amazon Publishing and its AmazonCrossing translation imprint are becoming one of the most internationally recognizable brands, both in the industry and on social media. The hashtag #readtheworld is connecting translation readers with each other during the Crossing free-books offer. As a reminder, Amazon Publishing is the house that recently added its 15th imprint in association with filmmaker Jill Soloway. The diversity-driven imprint Topple Books is a collaboration between Amazon Publishing, Amazon Studios, and Soloway’s Topple Productions. More from Publishing Perspectives on translation is here. More on AmazonCrossing is here and more on Amazon Publishing is here. And more about UNESCO’s World Book Capital is here and on World Book Day is here. 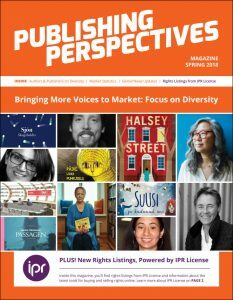 Don’t miss our Publishing Perspectives Spring Magazine, which is focused on inclusivity and diversity. It’s ready here for your download as a PDF, and was available in print at London Book Fair.